I came across this today that Zoe had retweeted, and when I looked into it I was really surprised at how badly a company’s social media profile was being handled. With generally all corporate social media profiles there is still just a human being behind them, who will at times over react but also not consider their customer reactions. 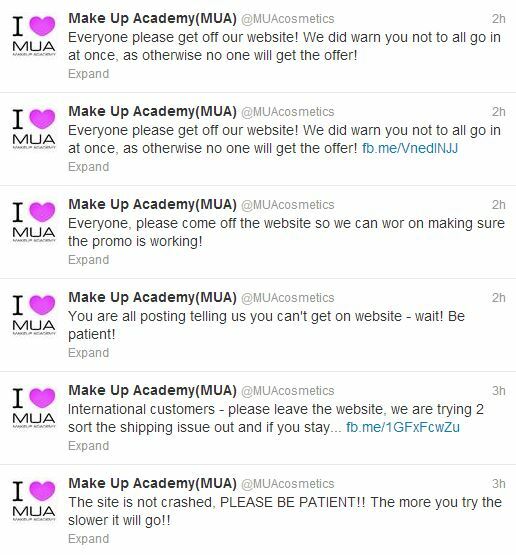 I hadn’t heard of MUA Cosmetics before… but I have now and first impressions aren’t great! Seems overly generous to me! So they announce their super promotion on Facebook, to their 50,000 fans … and voila their site crashes dramatically and people then start to complain about not being able to place their order. Seems the marketing department haven’t communicated the offer to their hosting company to be able to gauge potential traffic volumes to hit the server! Their reaction is to then tell people to get off their site … what, seriously… do people really leave a site when they are asked, or keep trying to see if it loads lol. Anyway here are some of the tweets! The other day I stumbled across a post on the internet that gave me lots of good ideas how to organise and simplify my world. 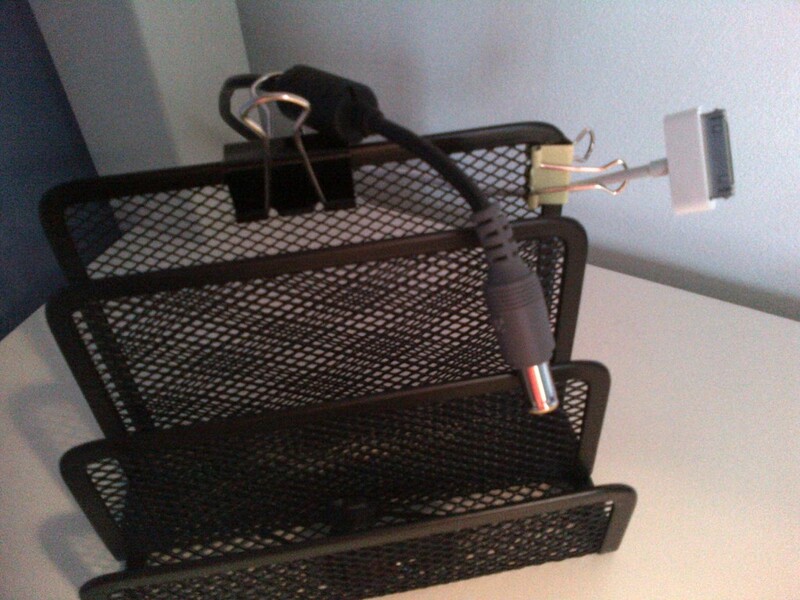 When I was sorting out Miles’ new bed and desk at the weekend I used one of the ideas to sort out his chargers for his laptop and ipad/ipod so that he always knows where his chargers are and so that they remain tidy. 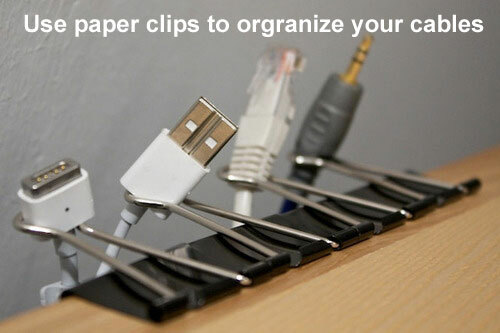 With the simple use of the bulldog / paper clips you can make sure that your chargers are always secured somewhere. With the thick laptop charger cable you can unhook part of the clip, thread the cable through and then rehook the arm of the clip back in place. The ends of the chargers are going no where. So in the last week we have seen three old high street retailers finally admit defeat and land themselves into administration (Comet, Jessops and HMV … Added 16th Jan – Blockbusters now too) leaving huge debts behind them and a flurry of job losses. The question that has been banded around for many years keeps raising its head as to what will become of the high street in years to come? The first thing that needs to be addressed is why are the retailers failing… and could they have done something to stop their demise? At the end of the day the world moves on and as a business you need to keep ahead of the changes that come about and evolve to meet the market’s needs. Did these retailers do this… well obviously not but was there much they could do about it? A lot gets blamed on the “internet” but people’s shopping habits and their spending power has changed over the last 4 – 5 years and this is where shops on the high street needed to change too. The old boss of HMV was reported to say many years ago that downloading music was “just a fad” but how far wrong was he, and how he would wish now that he was a leader at the forefront of grasping the new technology. When we went into HMV at the weekend there was so much stock of DVD’s and CD’s selling for next to nothing but lots of old titles that are readily available on Sky Movies or free to download from iTunes. Jessops declined due to the rise of camera phones and how we have abandoned the need for a separate digital camera and we now use our phones so much more. This is a similar progression with cameras as what happened when digital cameras dived onto the market and suddenly no one was buying camera film. Comet certainly faced additional competition from the internet especially when it comes to a company’s overhead of having to maintain a high street store compared to just a website and a warehouse, and people are able to become more price aware. They should have offered a higher level of service and value to make people want to remain loyal to their brand. I still believe that customers remain loyal to stores if the quality remains high, and the level of customer service in the stores remains the key. Sometimes it’s a much better shopping experience to go online, to a well designed site, with good choice and an easy checkout process than to go to a shop where there are miserable shop assistants whiling away their shift. I buy an awful lot online, but that’s the industry I’m in and find that I can’t get the choice from the high street, and with only a limited amount of spare time I can’t be doing with trailing round the shops to find something. Three or four clicks and I could get exactly what I wanted delivered the next day, at a really competitive price. The only things I would tend to buy from a shop would be expensive, large items and this has comprised in the last few months of a dining table and a new superking bed, but everything else I have to say is online. So what will be on the high streets in years to come? I live and work in Ripon in North Yorkshire, which is a City in its own right since we have a very old Cathedral, but it is typical of a market town. We have a market square with an impressive obelisk in the middle, surrounded by retail units with shopping streets leading off from the centre. We do have empty shops as every town has, but we still have new businesses opening which is hopeful. My thoughts for the future of Ripon is that over time the centre around the market square will be more residential with upmarket flats, alongside trendy cafes and bars. There will be more seating and community focused areas, maybe even a grassy park where the market place is and more pedestrianisation. On the outer streets this is where you will get the services and businesses that still need to be on the high street. If you are a hairdresser / barber you’re in the perfect industry..people will always need their hair cut. You’ll have the banks (even though many do online banking you still need to go into a branch), the estate agents (even though online sites are thriving you still need the agents), key cutting / shoe repair shops, chemists (as there will always need to be a way to get prescriptions and toiletries quickly), cafes, bars, restaurants, bakeries, sandwich shops, solicitors (unless they can ever go paperless), charity shops, beauty salons, dry cleaners….err anything else? Maybe there would be a resurgence of the green grocers and butchers as people become more “ethical” and sway away from the supermarkets….that would be good. One unique store that we have in Ripon is HandPickedHall which is situated in the building that was Philip Halls which was a small department store. Today the owner is leasing store space from as little as £10 a day to small businesses who want to get a start on the high street. With a number of retailers all under one roof you get a market feel to the premises where people can browse and shop and it becomes more of a shopping experience, and each trader can sell their products without the huge overheads of having your own premises. One thing is for certain the economy will continue to evolve and it’s not good enough in this fast changing world to carry on as you always have done if you have a retail store. You need to be thinking of how to keep customers loyal but also how to offer what customers want. Should high street shops, or independent high street retailers offer the ability to have products delivered by having a solid web presence too, or in the very least suggesting that their customers who make a purchase join a loyalty scheme or at least collect their email address so that you can send them regular newsletters or offers to keep customers regular. Or finding out from existing customers what would make their shopping experience better or finding out what else can be offered. It will be an interesting few years as more big retailers fail, as everyone needs to step up their game. Added 17/1/13 – Just something to add after a productive shopping experience in Ripon yesterday. We headed to the Post Office to return a jacket that I’d bought from Ness Online that was too big, so its going back to be exchanged for a smaller size, and decided to have a quick pop into Benson’s which is next door. Benson’s has been in Ripon forever and its a great hardware shop where you can pretty much find anything, but a few years ago they evolved which was probably one of the main reasons why they are still on the high street today. They transformed the upstairs of the shop into a den of Barbour, Hunter, Joules and all the high priced clothing that is essential wear for upmarket set around this area 🙂 With us just popping in to have a look around we ended up spending nearly £100 on a warm fleece Barbour jacket liner for me, which came with extra discount, and then a 100 year anniversary Stanley thermos flask will would fit well in Mollie the Samba. This just shows how old high street businesses can evolve to capture a new market.